The Queensland Maroons were solidly beaten in Origin 1, going down 28-4 to a rampant Blues side at Suncorp Stadium. It was one of NSW’s biggest ever Origin wins, and coach Kevin Walters will be under plenty of pressure to make changes ahead of Origin 2 in three weeks’ time. Here’s how the beaten Maroons rated in Origin 1. Didn’t disappoint, although did very little from the back in attack or defence. Boyd will keep his spot in the side for Origin 2, although he’ll move to the wing, replaced by Billy Slater at the back. Oates rates higher than many of his mates in Maroon due to his excellent AFL-style catch for Queensland’s only try. Made the most of the few opportunities that came his way, but is likely to be forced out by Darius Boyd on Slater’s return. Click here to see the NSW Blues player ratings. I didn’t see him out there, which is more than you could say for Justin O’Neill. Terrible match from the Cowboys three-quarter, who resembled a speed bump in defence and gifted Andrew Fifita a try in the second half after taking his eyes off the ball. Will be having Jarryd Hayne-shaped nightmares for years. Put together a couple of jinking runs and tallied over 200 metres, the Newcastle Knight has surely done enough to stop Valentine Holmes coming in for Game 2. Milford looked dangerous when the match was in the balance around half-time before copping a head knock from his own teammate. Thurston he is not, however. The Maroons’ best, Cronk created Queensland’s only try and was generally dangerous behind a busted forward pack. His kicking game kept Queensland in the match for longer than they should’ve been. Napa looked like he belonged at this level, until an injury ruled him out with just a quarter of the game played. Smith did what he could despite having little support from his props or second rowers. We dare not even whisper it, but there were some moments when he looked a little too old and too slow – so expect him to respond in Game 2. 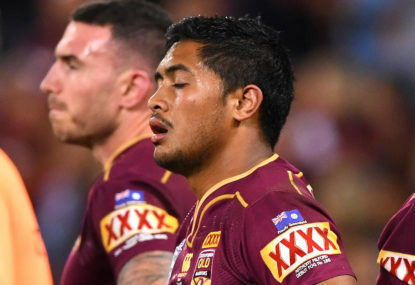 His missed conversion before halftime was a mental blow for the Maroons at a crucial moment – Thurston would’ve kicked it. Myles has been picked on reputation for a few years now, but without Paul Gallen to fire him up he seemed lost. Myles was lucky not to be charged for an eye gouge on Hayne and was otherwise poor in defence. Anyone have Coen Hess’ phone number? Another one who missed sparring partner Gallen, besides Smith Papalii was Queensland’s best forward and will definitely get another shot in Origin 2. A better than average performance from the Bribie Islander, although he’ll rue the day he sought to treat James Tedesco as a speed bump. McGuire’s job isn’t to be seen, and by that metric he did pretty well. McGuire got through plenty of work in the middle of the ruck. With the injury to Milford, Morgan played a greater role than he might have imagined, but was on too late to make much of a difference. Might lose his bench spot to Milford in Origin 2 if Thurston returns. Big Sam always turns up at Origin level, which is more than you can say for most of his teammates. A poor game from the big Rooster. How Josh Dugan stopped what would have been a certain try we shall never know. He wasn’t the worst in Maroon, we’ll give him that much, but Lillyman has played his last match for Queensland. Roarers, what did you make of the Blues in Origin 1? Drop a comment below and let us know.